Today as my four year old pulled a chair up next to me climb up into the chair to stand at the counter and help me prepare lunch. I am reminded very much of my four year old self happily standing on a chair stirring Spaghetti O's with my Granny standing beside me. I remember the small green pot we cooked in, and her aging hand guiding my little hands with a wooden spoon. Her house was my playground on any and every day she could convince my parents to let her have me for the day or even a couple hours. At the wonderment of her house in the eyes of my curious self, I would be fascinated with the colors and colors of yarn, I would play house with real pots and pans, with my little pink plastic stroller with a baby doll I gave a hair cute not so long ago am I sure ( thought she looked better bald), I would chase the big white cat, whom I thought needed to wear a dress. Most of all on this day I am remembering her. Remembering how much she loved in the short years she had with me. Remembering her curly hair, and her large rimmed glasses. Wishing I had more to remember, and wondering what she would think of me as grown woman Hoping she would be proud of me. Wishing she was still here to spoil my children with push-ups and square pizzas! Here is to remembering the Woman who fell in love with the American Solider, taught me to cook Spaghetti O's, spoiled me with love, and fed me as many push-ups as I could eat! 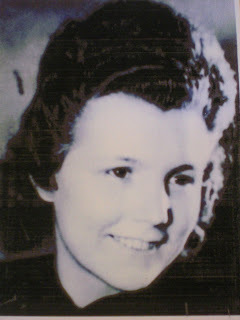 My dear Granny with her German spirit, and lasting impressions on a four year old pigtail wearing tomboy! My Granny the lunch lady....Because memories last a lifetime, and everyone deserves to be remembered, and love last forever!